have a parent with a drinking or drug problem. A brief look at some of the history of the 1900’s can clarify this phenomenon. Prohibition was repealed in 1933, and this tended to validate, or at least give some justification for, the consumption of alcohol by the World War II generation. Alcohol was associated with good times and the good life for what is sometimes called the “drinking generation” who lived through WWII, the survivors of whom are mostly gone now or at the very last stages of the life span. Their children, the Baby Boomers, who are now in middle age and entering older age, tended to use not only alcohol but drugs as well. And again, they often associated the use of these substances with good times. This substance-abusing legacy was often passed to their own children, who are now in the their thirties and forties. Unfortunately, and estimates of the numbers involved are vague, a certain proportion of those who use alcohol or drugs become addicted to these substances. Fortunately, within the past decade or two there has been a trend away from the use of alcohol and drugs as a source of pleasure, especially in view of the devastating impact the overuse of these substances can have on the user’s physical and emotional health, as well as the well-being of their families. It has been estimated that one out of three adults grew up in a dysfunctional household where a major focus was the overuse of these substances by at least one of the parents. The emotionally available parent is one who can read and validate the moods and needs of the children and who encourages their independence as they grow up. In these healthier households there is a sense of security, consistency and predictability. As the children grow up, they gain a feeling of trust and mastery in the world with the support of the parent. But what happens in the dysfunctional household where alcohol or drugs dominate the domestic climate? When an adult has formed a dependence on alcohol or drugs, the normal give-and-take of everyday life can become disrupted. Rather than working through daily problems and frustrations and modifying behavior to adapt to these problems, there is always the drink or drug at the end of the day. Have a drink and the problem goes away, at least in one’s mind. The parent is emotionally unavailable. Thus, the needs of the growing child are often ignored. The drunk or chemically influenced parent can hardly perceive the feelings of the child – and usually places his or her own needs over those of the child. Even if the parent is addicted to a substance but not using it at the time, there is still a tendency, because of how substance abusers approach the world and problems in general, to neglect the child’s needs. The healthy option for the chemically-dependent parent is to work on coming to terms with the impact of substance abuse on his or her own life and the life of the family. People who have grown up in households with alcohol or drug overuse on the part of a parent have some common characteristics. Although people from the general population can display many of these behaviors, people from dysfunctional families tend to have a higher incidence of these traits. Take a look at some of the more common patterns found in people who grew up with an alcohol or drug abusing parent. In substance abusing families promises are repeatedly forgotten, the parent’s moods are unpredictable, and celebrations or other family events are canceled. As a result the child learns not to count on others and often feels that others don’t care enough to follow through on their commitments. Thus, it becomes difficult for one growing up under these circumstances to form intimate and trusting relationships in adulthood. Personal boundaries are poorly defined and there is a proclivity to become enmeshed with a partner’s needs and emotions. A solid sense of self and personal identity is missing. Because of the constant pain of disappointment, the child growing up in a dysfunctional family learns to hide feelings. After all, what is the point in hurting so much of the time? When feelings are expressed in the family, they are frequently accompanied by outbursts of anger and are denied the next day, as if they did not happen. Thus the child learns that expressing feelings will have no positive outcome and they are not remembered the next day anyway. The child lacks good role models for expressing feelings appropriately. Growing up in a substance-abusing family leads to difficulty in forming intimate and spontaneous attachments later on in life. This is understandable when one considers that a climate of fear and unpredictability have prevailed in the household. Emotional overcontrol is the recurrent outcome. Things are Not Talked About. Dysfunctional families sometimes create a myth about how wonderful the family is. They tend to deny that problems exist or that drinking or drugs are tied to these problems. There is no good time to talk about family difficulties. If the parent is drunk or high it is impossible to talk, and when the parent is sober everyone wants to forget. Later in life the person raised in such an environment may lack the verbal and conceptual tools necessary to work through life’s normal challenges. The Child Becomes Either Overly Responsible or Irresponsible. 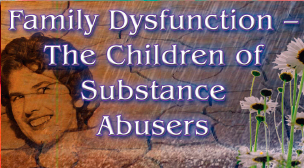 Children growing up in the substance abusing family cope by attempting to stabilize their chaotic environments and find ways to minimize conflicts or make the parent feel better. Later on they may become compulsive overachievers, taking pride in these behaviors they learned while growing up. They are the ones who help others, yet harbor anger when others don’t do for them to the extent that they do for others. Alternatively, siblings growing up in the same family might become irresponsible, hoping, as they did in childhood, that others might come through and take care of their needs. Regardless of the outcome, when they grow up they avoid looking openly into their own behavior and understanding the effect that it has on themselves and others. Self-Esteem and Confidence are Undermined. Children of substance abusers frequently failed to receive consistent support for their ideas and efforts. The needs of the parent usually came first, and a parent under the influence usually lacks the discretion to realize the impact of his or her anger or sarcasm on the child. When they grow up, the children doubt their own abilities and feel inferior or falsely superior to others. They doubt their own abilities (and may compensate for this through trying to control the outcome of uncertain events), get angry when things don’t go their way, or gossip instead of taking assertive action to confront an issue. In fact, they may feel guilty when they stand up for themselves or otherwise act assertively. They tend to spend their lives giving to others rather than taking care of their own needs, as if their own needs are unimportant. Those who grew up in substance-abusing households are known to blame themselves for their parent’s drinking or drug use. They grow up feeling they can’t do anything right, no matter how hard they try. They long for the approval they didn’t get growing up, and they judge themselves, and others, without mercy. They bargain with themselves: “If I only try this strategy, I’ll finally get approval and have success, and I have to do it well.” Thus, they become perfectionists. Furthermore, they will do anything to make people like them, remaining loyal to others even when the loyalty is undeserved. They feel that people who like them will not be critical of them. When others show anger toward them or personally criticize them, as they were perhaps criticized while growing up, they feel anxious and intimidated. After all, they are their own worst secret critics, and to have others engage in repeating the old patterns from childhood dredges up the unpleasant experiences once again. Another common pattern in this respect is fear of authority figures, people who have power that can sometimes be applied capriciously and arbitrarily, as it often was in childhood. Growing up is difficult enough as it is, but when a child lacks the support of an emotionally available parent, the task can seem arduous – and there are lingering aftereffects which can cloud life in adulthood. Many children growing up in substance abusing families can’t wait to leave home, with the notion that they will leave, put the past behind them, and then move on to a happier life. After all, they reason, the past is the past, so shouldn’t I just forget it and try to move on? Unfortunately, this strategy usually does not work and leads to more problems. It is during childhood that we learned how to deal with other people, with trust, with intimacy, with our self-image, and with our ability to process our thoughts and emotions. What we learned in childhood in a substance-abusing family perpetuates the old patterns: the lessons learned fail to meet our adult needs – or the needs of our own children. The first step in coming to terms with an emotionally conflicted childhood is to admit it, and this can be very difficult. We may have learned to use denial as a way of dealing with our parent’s substance abuse problem, in much the way our parent used denial in dealing with their own use of alcohol or drugs. It may seem that the pain is more easily handled when it is cast out of our minds. But it does not really go away. And the survival patterns we learned in childhood continue to interfere with happier experiences after we have grown up. It takes courage to confront the situation openly and honestly, but the payoff can be life changing. A healthy, functional, and satisfying life is possible and attainable. Another strategy is to learn more about the patterns that characterize adult children of alcoholic or drug-abusing families. There are several good books on this topic. And you are invited to come in for a therapy session to examine these patterns and see just how your childhood is having an effect on the way you live as an adult. You are not alone. Millions of adults grew up under similar circumstances. There are support groups for adult children of alcoholics, and there is AlAnon, a twelve-step program for the families of substance abusers. An effective way of coming to terms with this problem is through individual therapy. During the therapy process, you learn more about growing up in a substance-abusing household and that there is really no stigma attached to it. You learn about what happened and how it affects your thoughts and feelings today. You come to understand your own behavior much better. And you learn about different strategies for dealing with your loved ones, your friends, and your job. But most of all, you can come to terms with the feelings you have about your parents – and you may at some point learn truly to forgive them. They probably did the best they could and we can love them for that. And finally we learn that we are now responsible, as adults, for our own lives. Our choices are now our own to make. People who grew up with a parent who had a substance abuse problem often wonder how their brothers and sisters turned out to be so different. After all, everyone grew up in the same household, so why aren’t all the siblings alike? In all families, substance abusing or not, brothers and sisters need to claim their own unique identities. We need to find ways that we are not like others in the family, and this helps us to form our own identities and sense of self. In the alcoholic or drug-abusing family each sibling finds his or her own unique way of coping with the conflicts. Claudia Black, an expert on adult children of alcoholics, and others have identified different roles that can emerge among siblings, each of whom tries to make sense of the chaos. These children try to make sure that the family appears normal to the rest of the world. They develop a strong sense of responsibility and project an image of competence and achievement. This is often the first-born child, but not always. They learn as children that someone has to be responsible for the family, and if the parents are inducing chaos, it is up to the “hero” to provide stability. These people often grow up to be academically or professionally successful, although they often deny their own feelings and may feel like imposters. In order to cope with the conflicts within the family, these people adjust – but often in inappropriate ways. They often become invisible and avoid taking a stand or rocking the boat. They learn never to plan or to expect anything, and they deal with conflict by avoiding it. In adulthood “adjusters” may feel that their lives are out of control and that they are drifting meaninglessly. The Placater. These siblings are the ones who learn early to smooth over potentially upsetting situations in the family. They develop a good ability to read the feelings of others, but at the expense of their own feelings. They tend to go into caretaking professions later in life, even though this may reinforce their tendency to ignore their own feelings. The Scapegoat. These are the children who become known as the family problem. They have a tendency to get into trouble, including alcohol and drug abuse, as a way of expressing their anger at the family. They serve as the “pressure valve” in the family: when tension builds, they misbehave as a way of relieving pressure while allowing the family to avoid dealing with the parent’s drinking problem. When they grow up, they tend to be unaware of feelings other than anger.